The most despicable philosopher in the West finds a new reason to put down Gandhi. 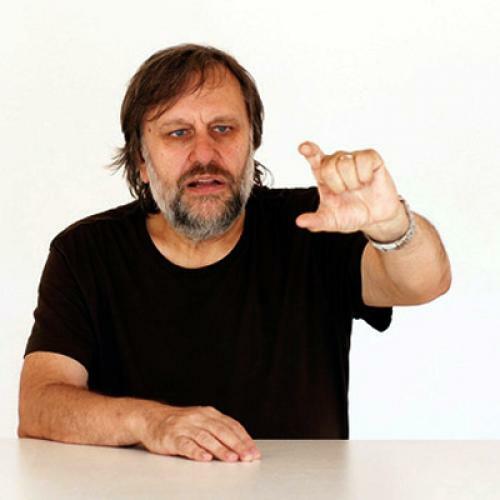 Pity is not one of the qualities one associates with Slavoj Zizek, whose radicalism runs more towards fantasies of purgative violence. But in a recent interview with The Times of India, he indulged in at least a little pity for himself, complaining that “now they say I am the most dangerous philosopher in the West. But I don’t care.” He was referring, I presume, to an article I wrote in The New Republic in the fall of 2008—though, to be a stickler about it, the cover line for that article called him the most despicable philosopher in the West. You have also been critical of Gandhi. You have called him violent. Why? It’s crucial to see violence which is done repeatedly to keep the things the way they are. In that sense, Gandhi was more violent than Hitler. A lot of people will find it ridiculous to even imagine that Gandhi was more violent than Hitler? Are you serious when you say that? Yes. Though Gandhi didn’t support killing, his actions helped the British imperialists to stay in India longer. This is something Hitler never wanted. Gandhi didn’t do anything to stop the way the British empire functioned here. For me, that is a problem. I guess you have no respect for Gandhi who is a tall figure in this country. I respect him. But I don’t respect him for his peaceful ways, vegetarianism, etc. I don’t care about that. To recap: Writing to TNR, Zizek suggested that Gandhi was more violent than Hitler because his peaceful protest movement “effectively endeavored to interrupt” British imperialism. Now, speaking in an Indian newspaper which most of his American readers will never see, Zizek says the precise opposite: Gandhi was more violent than Hitler because he failed to disrupt British imperialism, and so was objectively responsible for continuing the violence of the Raj. (If Gandhi had taken up arms, presumably, Zizek would consider him less violent, because anything that ended British rule would have been a net gain for peace.) He then adds a grace note—that Hitler was a better anti-imperialist than Gandhi, because he “never wanted” the British Empire to be preserved! In fact, this is historically incorrect: in the early stages of World War II, Hitler wanted to strike a deal with the British, which would preserve the Empire in exchange for German superiority on the Continent. But that is not the main point. What matters is that Zizek now explicitly denies what he tried to imply in TNR, that he has any kind of admiration for Gandhian nonviolence: “I don’t respect him for his peaceful ways.” I am not surprised by this; Zizek is, after all, the author of a book called Violence in which violence is quite openly defended. What does surprise me is the pure hypocrisy that his interview exposes, and the total absence of consistency in his thought and public speech. In the same interview, Zizek also complains that “In the last two years, the tone has changed” in the West regarding him and his work. Let’s hope so. Adam Kirsch is a senior editor of The New Republic.